MINNEAPOLIS (CNS) — Vaughn Treco, a husband, grandfather of two and former Anglican priest, was ordained to the Catholic diaconate and priesthood in early May with the approval of Pope Francis. His ordination as a Catholic priest who is married is allowed as an exception to the normal requirement for celibacy. Father Treco will serve within the geographic boundaries of the Archdiocese of St. Paul and Minneapolis as a member of the Personal Ordinariate of the Chair of St. Peter as the priest for a community of former Anglicans. The small community of 10 people worships on Sundays at Holy Family Church in suburban St. Louis Park. Called the Society of St. Bede the Venerable, they have been under the care of Benedictine Brother John-Bede Pauley of St. John’s Abbey in Collegeville. “They’ve been functioning as a society, and my task is to grow it into a parish,” Father Treco told The Catholic Spirit, archdiocesan newspaper. 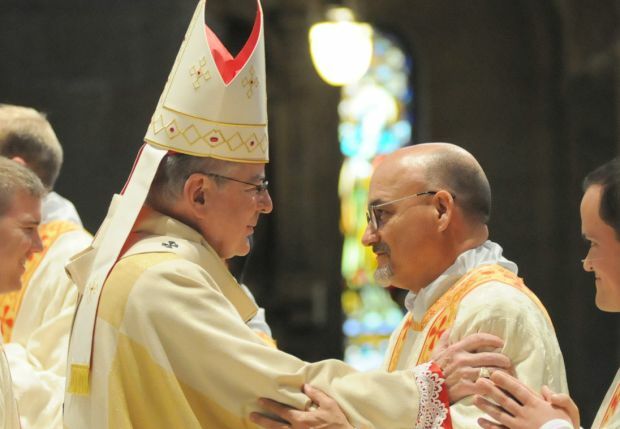 Father Treco, 52, was ordained to the transitional diaconate with other transitional deacons from the St. Paul Seminary by Archbishop John C. Nienstedt May 2 at the Basilica of St. Mary in Minneapolis. Auxiliary Bishop Andrew H. Cozzens ordained him to the Catholic priesthood May 3 at Holy Family. In a letter to priests of the archdiocese that invited them to attend the priesthood ordination, Bishop Cozzens explained the circumstances that have brought Father Treco to the Catholic priesthood. Msgr. Jeffrey Steenson, head of Personal Ordinariate of the Chair of St. Peter, approached Father Treco in 2014 about the need for a priest to serve the small ordinariate community in Minnesota. Father Treco became a Catholic in 2000. “The more closely I read Scripture, the more it seemed that Catholic Church teaching cohered to Scripture,” he said. Born in Nassau, Bahamas, and raised in a deeply religious Plymouth Brethren family, Father Treco attended an evangelical seminary in Illinois and graduated with a master of divinity degree. In 1991, he launched and developed the New Providence Community Church in the Bahamas, an evangelical church with a mission focused on reaching young, college-educated people for Christ. After discovering what he described as discrepancies in evangelical teaching, he and his wife, Norma, joined the Charismatic Episcopal Church. Nine months later, in 1999, he began the Rite of Christian Initiation of Adults and became a Catholic in 2000. Since then, he has served in Catholic pastoral ministry as program director for marriage preparation and enrichment in the Diocese of Arlington, Virginia; as a parish youth minister, and established “parishREACH,” an apostolate that trains and equips Catholic parishes to more effectively evangelize men, women and families within their local communities, Father Treco said. For three years, he did Catholic graduate theological studies in Arlington and completed another six-month program in Catholic theology in Houston in 2013. The Divine Worship of the Ordinariate of the Chair of St. Peter — what was formerly called the “Anglican-use” Mass — “harkens back to a Tridentine kind of complexity,” Father Treco explained. Zyskowski writes for The Catholic Spirit, newspaper of the Archdiocese of St. Paul and Minneapolis.